The mixed metaphors of Jordan Peele’s Us. Imagine two parallel lines, like the number 11. 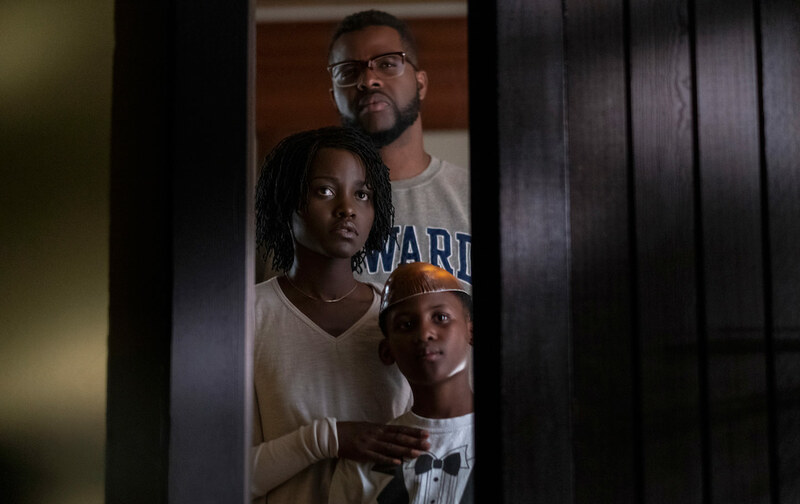 Now tilt them until they converge at their base, like the letter V. This movement—like a pair of scissors opening and closing—is the valve at the heart of Jordan Peele’s new movie, Us. There are symmetries and splits, parallels and intersections, echoes and reflections. And, of course, there are doubles. Sometimes, they stand across from you and stare. Sometimes they reach out to you and grasp. It’s hard to say which is more terrifying. The film opens with a shot of a TV playing a portentous foreshadowing: a Cal 11 news clip from 1986 about Hands Across America, a publicity campaign in which 6.5 million people held hands and formed a human chain across the country to raise money to fight poverty. Right as it ends, we see reflected in the screen the face of a little black girl watching it. Adelaide goes out with her parents—sniping, unhappy—to the Santa Cruz boardwalk, with its creepy, Lynchian intensity: bright lights, clown colors, roller-coaster shrieks, weirdo bystanders. She slips off to the beach, and walks into an amusement hall called Shaman’s Vision Quest (tagline: “Find Yourself”). She bounces around the house of mirrors like a pinball, doubling across the screen, until finally we notice that though she is still moving, her reflection has stopped. She turns to face the back of her head in the mirror. The girl in the glass turns, tilts her head, and smiles. It is a slick and shivery sequence. After the opening credits, a satisfyingly slow zoom out from a grid of caged rabbits, the film skips to the present day. The Wilson family—an adult Adelaide (Lupita Nyong’o), her husband, Gabe (Winston Duke), their daughter, Zora (Shahadi Wright Joseph), and their son, Jason (Evan Alex)—are taking a vacation to Santa Cruz. They go to the beach to meet up with their friends, a white family comprising a pair of louche parents (Kitty, played by Elisabeth Moss; and Josh, Tim Heidecker) and a pair of indistinguishable teenage daughters. There’s some gentle satire about the black middle class (“It’s a dope song. Don’t do drugs,” Gabe schools his kids about “I Got 5 on It”) and the white middle class (“It’s Vodka-o’clock,” Kitty drawls). Along the way, Peele builds the usual suspense: a jump scare, a spider, long shadows, a scarecrow, a bloody hand, a poor imitation of a kid’s creepy drawing, and Adelaide’s PTSD flashbacks of her traumatic childhood incident. The doubles are deftly done. They’re played by the same actors, each split resemblance gaining a rough edge through the slightest deviations, like a rip in a paper doll. Gabe is an amiable lout, his double a lumbering brute. Zora is a track star; her double moves double-time. Jason keeps trying to work a finger-flasher toy; his double is a pyromaniac whose mask conceals burn scars. And Adelaide—in an extraordinary turn by Nyong’o—is herself, but skewed: a dancer, a mother. When her double recounts the origin story of “the Tethered,” surprisingly early in the film, the words are less creepy than Nyong’o’s voice, which scrapes and whistles and skips like a record. During the film’s climax—a dueling dance between doubles—the very movements of her body raised the hair on my arms. Why is doubling so uncanny? One theory says that the uncanny often draws on the familiar, the homely, the comforting. (Dolls and stuffed animals are a good example, as a dismembered toy rabbit in Us attests.) This suggests that it marks the fearful “return of the repressed”—of all that is childlike, naive, or primitive in us. We can call this the psychological explanation. Another theory says that doubling freaks us out because it eludes reason. The relationships between some recurrences—repeatedly seeing the number 11, for instance, as Adelaide does in the film—cannot be explained via cause and effect. These “acausal” phenomena—like déjà vu, synchronicity, or a preponderance of coincidences—suggest that there is some secret order or meaning that we just don’t have access to. This is the supernatural or metaphysical explanation. More recently, we’ve seen many works of art look to scientific mechanisms—robotics and cloning—in order to evoke the “uncanny valley,” which maps the degree to which a humanoid object can resemble us before it starts to skeeve us out. There are many different explanations for why near-resemblance spooks us, most of which have to do with biologically adaptive responses to stimuli. In every case, the uncanny involves an element of mystery. Peele could have left the cause of the doubling in Us mysterious by omitting any explanation for it at all. Instead, he offers several competing ones. The Tethered are shadow beings, mirror reflections come to life, “two bodies, one soul,” an underground tunnel world of doubles who drowsily, manically synchronize the actions of those on the surface above. They might be products of Adelaide’s psychic schism—hence, PTSD. They might be clones wandering around an abandoned lab—hence, rabbits. There are plausibility problems with all of these ideas. What happens to your double if you get in a car? Where did they get their fly red jumpsuits and sharp gold scissors? If Adelaide’s double is a clone, then are the children she says she birthed the clones or the siblings of Jason and Zora? And that’s only at the level of plot. What’s the Value of an Athlete’s Labor? When it comes to what it all means, the possibilities redouble just as endlessly, and a little fruitlessly. Take the cast of characters. Two families: one black, with a boy and a girl, as if reflections of their parents; and one white, with a pair of girls. These doubles could symbolize divisions between genders, races, generations, social classes, physical abilities. They map onto binaries like human vs. animal, muteness vs. speech, sanity vs. insanity, normal vs. deviant, and, of course, since it’s a film, image vs. reality. Kitty’s double applies pink lipstick to her loony smile and you almost see Moss’s Mad Men character, Peggy, hovering in the mirror. Doubling tends to redouble across scale—it’s a kind of fractal law of the Gothic. It seems inevitable that the psychic split at the start of the film would open up to an internal family drama, then a neighborhood rivalry, and eventually a national crisis. Of the many answers Adelaide’s double gives to the question “What are you?,” the most incongruous one is: “We are Americans.” At SXSW, Peele said the doubles represent Americans’ fear of outsiders: “We’re in a time where we fear the other… Maybe the evil, it’s us.” This feels somewhat generic, in both senses of the word. Personally, the interpretation I’d select from the option menu would be class, which seems to be the clearest through line between the film’s story, visual tropes, comic gags, and genre gimmicks. When the doubles first appear in the driveway, there’s a pitch-perfect sequence in which Gabe systematically steps up his blackness to try and scare them off. I thought the visual nods to the American carceral system—cages, handcuffs, cops, jumpsuits—were building toward a unified critique. But as if bucking the weight foisted upon his directorial debut, Get Out, Peele seems to be teasing us with political allegories rather than leading us toward any one in particular. Peele has been insisting for some time that Us is a just horror movie. It’s no coincidence that the family of heroes bears the surname Wilson, likely a reference to Edgar Allan Poe’s doppelgänger tale, “William Wilson.” Poe’s hero meets his hoarse-voiced double as a boy, only to be haunted by him throughout his adult life until the bitter end—of a sword. Us includes several visual horror allusions—to Friday the 13th, A Nightmare on Elm Street, Cape Fear, Black Swan—and even a nod to the importance of the car keys in Get Out. Peele, who will be spearheading the new Twilight Zone for CBS, has said that the original series’ episode “Mirror Image,” from 1960, inspired the film. But Alfred Hitchcock is the presiding artistic influence. When you analyze Us visually, you see mirroring across vertical and horizontal axes, manipulations of depth and surface, parallels and forks, layers and scrims and slices. At one point, we encounter an escalator in an unexpected place, bathed in golden light. (The 21st-century version of a social ladder?) The foreshortened perspective from above turns the handrails into a great big V that smoothly swallows the parallel grooves of the stairs. Adelaide Wilson, our Alice in Wonderland, steps onto it and descends underground, where rabbits and horrors and red queens abound. As with Hitchcock, Us is replete with symbolic representation, the screen crammed to the edges with Easter eggs. Every detail could be significant. And again, as with (some) Hitchcock, you feel as though the pleasures available here are more cerebral than emotional. Depicting the uncanny and enacting it are different projects. Hearing Kitty’s daughters say the same thing at the same time, then chant, “Jinx. Double jinx. Triple jinx. Black out,” is fun but doesn’t quite give you the eerie giddiness that you felt playing that game as a kid. And it’s not easy for a movie to make you feel the terror of seeing your own face on another person. The Wilsons’ eyes may widen with fear as they each meet their respective double, but we’re just watching a bunch of twins on screen. The uncanniness of doubling is a universal yet private feeling: only your personal doppelgänger gives you the heebies. Us does its genre job: It makes you gasp, jump, and wince. But the terror is ultimately tamed by its intricate design. Doubling makes the film into a machine of correspondences, too countless and too hermeneutically sealed for you to feel truly thrown into the wilds of, say, “the sunken place.” There are so many coincidences that you come to expect them. Given all this symmetry, the only real possibility for surprise is reversal—and I guessed that final twist, not while watching the film but while watching the trailer. The doubles’ final show is likened both to a demonstration and to “fucked-up performance art.” Only the second comparison feels apt. Contrary to Peele’s protestations, his sophomore effort seems, like many conceptual works, to be more interested in its own form than in our feelings, in art practice than political praxis. It’s fitting that the film opens with a little girl turning to face herself. There’s neither genuine cathartic horror nor profound human depth to the doubling in Us. Namwali Serpellis a Zambian writer and Associate Professor of English at the University of California, Berkeley. Her first novel is The Old Drift (Hogarth, 2019).